Hypothyroidism, also called underactive thyroid, is a condition that occurs when the thyroid does not make enough thyroid hormones. The thyroid is a butterfly-shaped endocrine organ located at the base of your neck just below the larynx. It releases hormones that control metabolism. Autoimmune problems, radiation therapy, radioactive iodine, thyroid surgery and certain foods and medications can cause hypothyroidism. When you have an underactive thyroid, you should avoid foods that interfere with thyroid function. These foods include spinach, kale, broccoli, turnip, mustard greens, cauliflower, Brussels sprouts, cabbage, millet, cassava, linseeds and pine nuts, according to the University of Maryland Medical Center. Consult your doctor before you take soy products because they may interfere with the absorption of thyroid hormone. Soy products include soy milk, tofu, soybeans and soy sauce. If you have hypothyroidism, avoid taking caffeine, tobacco and alcohol. Caffeine is a stimulant drug that can affect thyroid functioning. Caffeine is found in coffee, tea, chocolate, energy drinks and soft drinks. Tobacco contains nicotine, a psychoactive ingredient that can affect the thyroid. Alcoholic beverages such as beer, wine and spirits can also affect the thyroid. Avoid taking drugs without consulting your doctor because some medications can cause hypothyroidism. Drugs used to treat hyperthyroidism are the most common causes of hypothyroidism, according to PubMedHealth. Hyperthyroidism drugs include radioactive iodine, methimazole and propylthiouracil. Treatment of hyperthyroidism with these drugs can cause irreversible hypothyroidism. Other drugs that can cause hypothyroidism include lithium and amiodarone. Hypothyroidism causes your metabolism to slow. At first, you may notice that you are fatigued and sluggish. As your metabolism continues to slow, additional symptoms of hypothyroidism include increased sensitivity to cold, headaches, a swollen lump at the base of the neck, constipation, slow heart rate, brittle hair, pale dry skin, voice hoarseness, puffy face, depression, muscle stiffness, menstrual problems and unexplained weight gain, as well as slowed growth and development in children, according to MayoClinic.com. 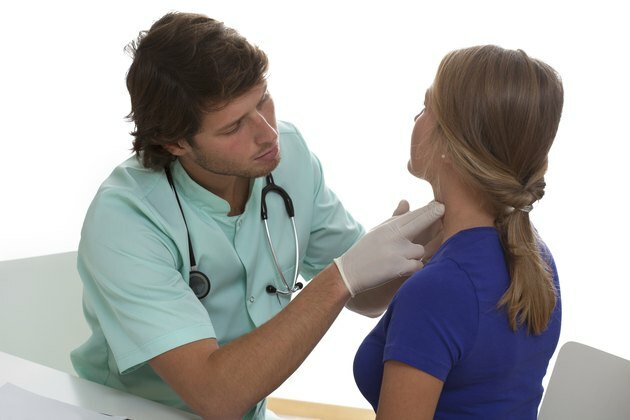 What Are the Causes of a Swollen Thyroid?